2019 Harley-Davidson® Softail® Heritage Classic 114 FROM THE SHADY SIDE OF THE FAMILY TREE The dark style, modern edge and reinvigorated ride of the Heritage model take nostalgia ripping into a new place. Features may include: TRADITION IS GOOD, BUT IT DOESN’T MEAN SITTING STILL A DARK CLASSIC WITH MODERN EDGE Dripping with gangster-era style and vintage details. If Bonnie and Clyde rode a Harley®motorcycle, this would be the one. 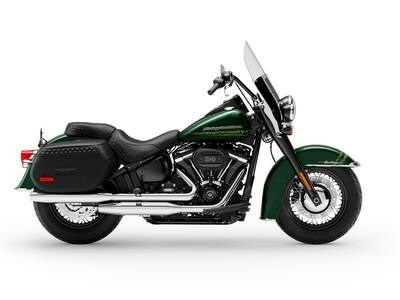 SOFTAIL®FRAME The reinvented frame retains the classic Softail®lines, but its lightweight design and stiffness translate to a responsive ride unlike anything you’ve felt before. MILWAUKEE-EIGHT® BIG TWIN ENGINE A powerful, smooth-running engine with crisp throttle response and a pure, soul-satisfying rumble. Available in 107 and 114 engine displacements. SIGNATURE LED FORWARD LIGHTING Darkness-defying lighting that gives you great visibility at night. LOCKABLE AND SEALED SADDLEBAGS A sleek look on the outside and roomy on the inside with enough space to stash your riding essentials. The lids open with one touch. DETACHABLE WINDSCREEN Go from touring to cruising in a heartbeat. Leave the screen on for a clean envelope of air over the long haul. Or remove it in seconds for a completely new look and ride. HIGH PERFORMANCE FRONT SUSPENSION Sophisticated suspension technology provides the performance of a racing-style cartridge fork for reduced weight with linear damping characteristics. HIGH PERFORMANCE REAR MONO SHOCK Easily adjustable mono-shock rear suspension allows for dynamic cornering capability while preserving the hardtail look.